I’m Head of Performance Systems Group whose purpose is to improve the overall performance of the car. We seek to achieve this in two ways; firstly, we provide objective advice and support to other departments to make the best decisions in vehicle design or operation (Design office, Aero, Transmission, Race Team etc..) and secondly, we aim to pro-actively develop performance concepts in chassis control systems, suspension, steering, brakes, tyres and vehicle setup. Part of our challenge is to achieve a well-balanced split of resources between reacting to other departments’ needs, which often are short-term driven, and a more pro-active and sustained approach to performance which will lead to genuine long-term progress. To support our objectives, we also develop vehicle models and simulation methods, and we run testing programs on transmission, suspension and brake testing facilities, either at Enstone or externally. First thing I will look at the job list and go through emails. We work in very close conjunction with lots of other departments so I need to be up to speed with developments in many different areas. There’s a lot of meetings, which can be very varied – one day I can be discussing brake specification for the coming race, another day it can be looking at getting the most out of the tyres and correcting balance issues picked up in the previous races. I also have to look a bit further into the future too – I’ve been involved in discussions on the forthcoming regulations and trying to position ourselves well. I also go to around four races per year and various meetings with the FIA so each week can be quite different from the previous! I had always been interested in motorsport, so I graduated in mechanical engineering from the University of Liege and followed up with a Masters in aeronautical engineering at Cranfield. My first job was working with AP Racing in Coventry. After two years I moved to Prodrive where I became a rally engineer on the Subaru World Rally Team. I had the luck to work with some great drivers, including Colin McRae, Richard Burns and Tommi Makinen. In 2001 I got paired with Petter Solberg – he was a young rally driver at the time and I worked with him from that point to when he was World Champion in 2003. I became Chief Rally Engineer in 2004, but after a while I dabbled in sportscars, which Prodrive also ran. I enjoyed that so I started to focus on endurance. This led to joining Peugeot in 2009 when they were competing in the World Endurance Championship. I was fortunate to be the engineer on the #9 car that then won Le Mans 24 Hours in 2009. After Peugeot stopped I joined Lotus F1 Team as Head of Vehicle Performance Group and then moved up to my current role three years ago. I’ve been lucky enough to have lots of memorable moments in my career. Petter’s World Championship win in 2003 was awesome as it was the culmination of a three year ‘project’ that seemed like a lost cause initially! Peugeot’s Le Mans win in 2009 was extremely satisfying – when you work in endurance you focus on that race and to win was an amazing feeling. 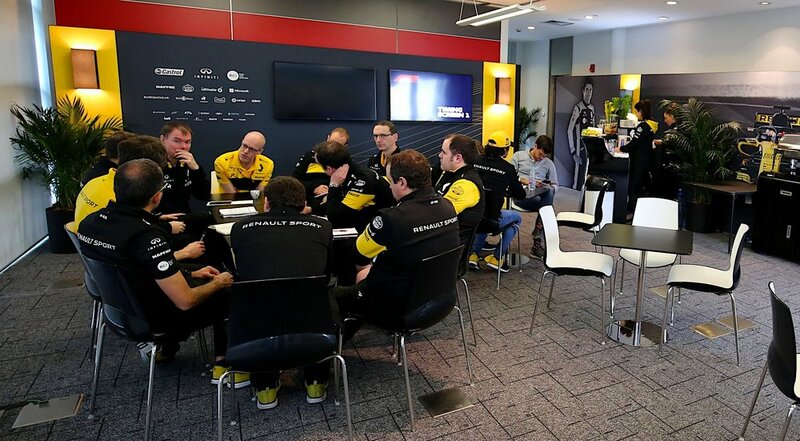 I do believe that we are really moving forward here at Renault though so hopefully the best is yet to come. There’s so much going on technically in the team that there is just too much to do, even with a good amount of delegation. We have more ideas than we have time for! But that’s the nature of the sport and the role – it’s pressurised and you have to create different ways to deal it. Getting things right with other departments and working as part of a team. When you have a good idea and are able to put it into practice and see it work, it’s a great feeling. After I’ve helped to put the kids to bed, unfortunately I do have to do a lot of work to keep up with everything, but I make time to catch up with my wife, normally over a good glass of red wine! Plan B… If you weren’t doing your job, what would you have done instead? Probably something to do with another form motorsport or cars. Most likely rally car engineering.